In the previous post on creating an ecommerce store with WordPress, we learned how to set up an ecommerce store in WordPress with the help of WooCommerce. We covered topics such as shipping, inventory, adding new products, WooCommerce themes and extensions, and more. However, we’ve yet to discuss what to do if your focus is not on physical goods, but instead you’re just selling virtual or digital goods that can be downloaded — such as ebooks, images, fonts, templates and Sketch/Photoshop brushes, themes or plugins, etc. For such stores, WooCommerce can still get the job done with ease. With that said, many WooCommerce features — such as inventory management, shipping settings, etc. — will be of little use here and might just appear to be an overkill. As a result, it’s probably better to turn towards a dedicated solution for selling digital goods. Easy Digital Downloads is a handy and totally free WordPress plugin that specializes in building ecommerce stores for digital and downloadable goods. Much like WooCommerce, Easy Digital Downloads too is very popular and has millions of users. In this article, we’ll be taking a closer look at the various features of Easy Digital Downloads WordPress plugin. As mentioned, Easy Digital Downloads is a free WordPress plugin meant for ecommerce stores that deal in downloadable digital goods. The core plugin in itself is free, but you can opt for membership passes that allow you to access all or some of the extensions of the core plugin. Using Easy Digital Downloads is straightforward to set up. You can install it from the official repository, just as you would install any other free WordPress plugin. Once it’s installed, you simply go ahead and activate the plugin. Unlike WooCommerce, Easy Digital Downloads doesn’t group your products as “Products” but instead as “Downloads”. 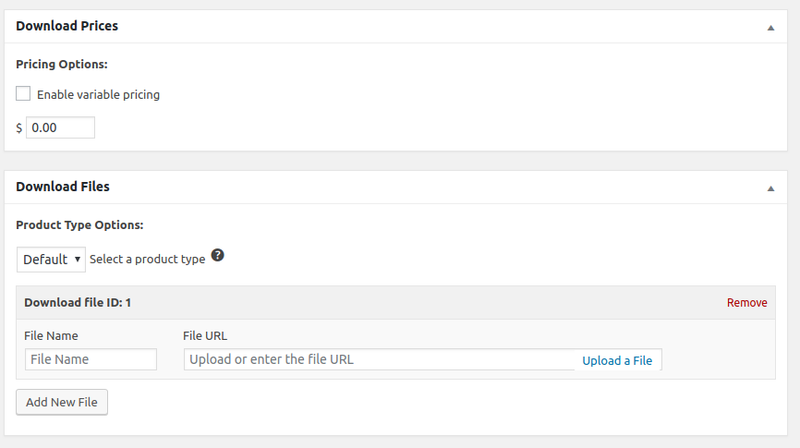 After activating the plugin, you’ll notice a new menu in your WordPress admin panel named Downloads. This is where all the action related to the management and functioning of Easy Digital Downloads tends to happen. Like WooCommerce, Easy Digital Downloads comes with its own set of integrations and payment gateways, and added features such as discount codes, coupons, customer records, and more. Also like WooCommerce, Easy Digital Downloads has its own ecosystem of extensions that can be used to extend and enhance the functionality of the core plugin. Commonly called “add-ons”, such extensions are available in both free and premium flavors. For the premium extensions, it might be a good idea to look at the official Easy Digital Downloads store. The free add-ons for Easy Digital Downloads be found in the official WordPress plugin repository. It’s worth noting that Easy Digital Downloads has a subscription model for pricing, and if you’re planning to be a long-term user of the plugin, it might be a good idea to opt for one of the subscriptions. For agencies and freelancers, $499 per year provides an all-access pass to all the add-ons and extensions of the plugin and also the ability to use those extensions on an unlimited number of sites. On the other hand, for single-site licenses, pricing options range from $99 per year up to $299 per year. Easy Digital Downloads adds a custom post type, Downloads. This means there’s a set of custom taxonomies as well: your downloads can have their own categories as well as tags. Furthermore, all your downloads can have a featured image that’s prominently displayed on the front end. Adding a new downloadable item to your store, as a result, is as easy as adding a new blog post to your site. Simply navigate to the Add New Download sub-option in the Downloads menu. Once you’re done adding details such as title, content, download category and tags, you can scroll down for advanced options. You can choose to use a simplified pricing for your download, or you can have a variable pricing as well (ebook+code files, for instance), in which you get to specify different prices per option. It’s noteworthy that Easy Digital Downloads lets you select between two product types. On one hand, there’s the Default product type that’s just a downloadable item, complete with a target URL to the ultimate file. On the other hand, there’s also a Bundle product type — which is, as the name suggests, a bundle of multiple products clubbed together as one. There’s also an option to limit the number of downloads for a given product. Perhaps, say, you only want the customer to access the download link five times. 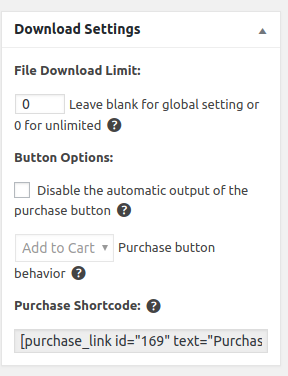 You can also disable or modify the default behavior of the Download/Buy Now or Purchase button. Easy Digital Downloads also generates a default shortcode for each product that you add. You can then use this shortcode to add a Purchase link for the given download on any given page or blog post of your site. Once you’re done editing, you can simply hit Publish to take your download live for the world to see and purchase. The Settings option can be found under the Downloads tab itself. It’s divided into various sub-sections that you can scroll through and configure as required. For instance, in the General page, you can specify your base country as well as custom pages for Checkout, Account Management and other purposes, and even set the default currency to be used on your store. 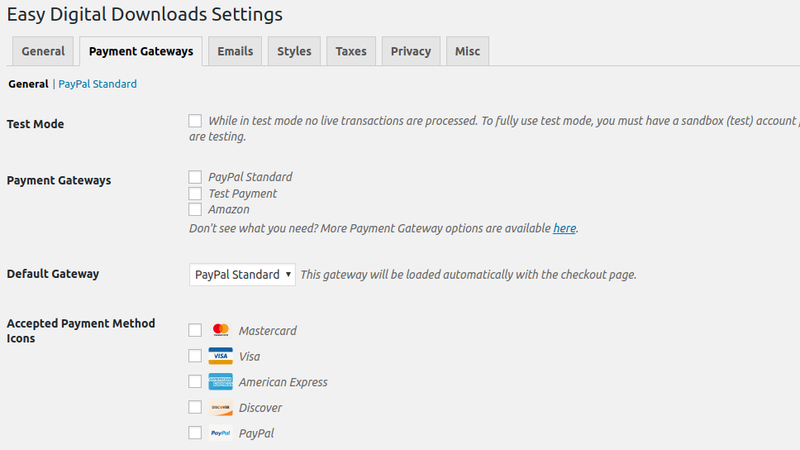 Easy Digital Downloads supports PayPal Standard and Amazon as payment methods out of the box. You can make use of add-ons and extensions to configure custom payment gateways, or stick to PayPal Standard and Amazon for processing payments. Regardless of which you choose, if you’re accepting credit cards, you’ll need to set up additional gateway options, depending on which payment processor you’re relying on. Easy Digital Downloads lets you configure email templates that are sent out to your buyers, such as the Purchase Receipt. You can upload your logo, add custom subject and content, etc. Similarly, you can also disable the native Easy Digital Downloads styling for buttons and other elements, such as when you’re using your own custom CSS or if your theme comes with its own styles for Easy Digital Downloads elements. 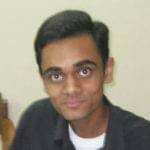 Easy Digital Downloads is, by and large, a perfect ecommerce plugin as far as compliance is concerned. 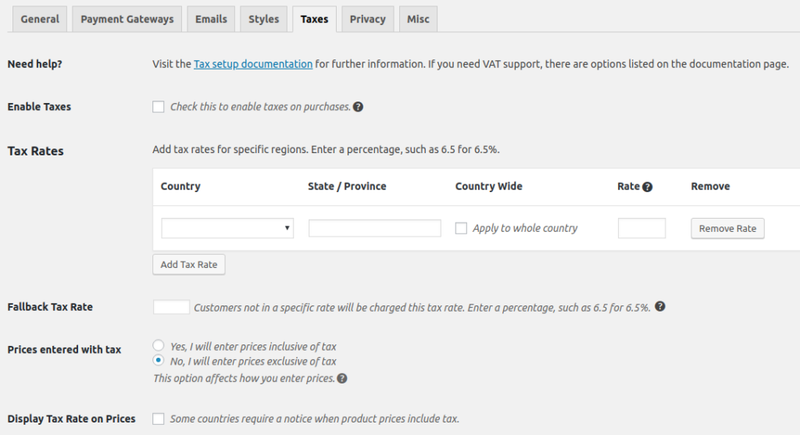 Depending on your country’s regulations, you can add custom tax rules, VAT rules and other factors right in the Settings page and have the same applied to checkout automatically. Lastly, there are several random options that can be configured for easier maintenance. For example, you can allow your customers to use multiple discount codes on the same order. Alternatively, you can enforce SSL on all ecommerce-focused checkout pages, require your users to verify their email in order to fulfill a purchase, and so on. Easy Digital Downloads is a fairly complete WordPress plugin when it comes to running an ecommerce store for selling digital products and downloadable goods. As far as the themes are concerned, there are fewer WordPress themes available for Easy Digital Downloads as compared to WooCommerce WordPress themes. With that said, many premium theme providers, such as Array Themes, offer good quality premium WordPress themes that come with Easy Digital Downloads integration. The official WordPress repository also has some impressive themes that are also compatible with Easy Digital Downloads. As your store grows, you might need to turn towards additional configuration and advanced customization options. Depending on your country’s laws, you may need to take into account taxation, accounting and other variables. Furthermore, based on the response from users and your own experience, you may find that a given payment gateway suits your needs better than the other ones. Such insight can only be had when running an actual ecommerce store. For example, while PayPal is possibly the best option when selling to the USA or Europe, AliPay is far more popular in China. Naturally, such requirements and needs tend to vary from one ecommerce store to another, and you’ll need to pick the ideal ones on the basis of your own given needs. Finally, whether you’re using Easy Digital Downloads or WooCommerce, be sure to follow the standard security norms: keep it updated, and select extensions and add-ons only from reputable sources!